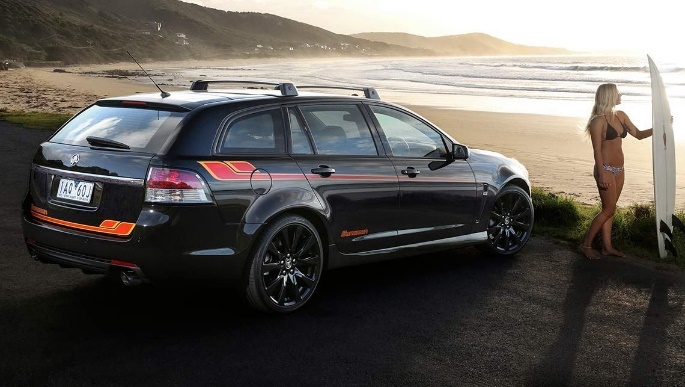 Here Comes The Sandman – but will Holden’s revival of this Great Australian Icon backfire? In a final fling before local production ends in 2017, Holden has brought back the ultimate Australian love machine, The Sandman. But the new version (above left) is already being slammed on Facebook, with die-hard fans lamenting its design. Phrases like ‘epic fail’, ‘it’s just a boring station wagon’ and ‘cheap marketing trick’ may make it hard for Holden to reignite the sparks of old. The controversial new model will greet the world in its first public appearance at the Bells Beach Classic surfing competition in Victoria over the Easter weekend. 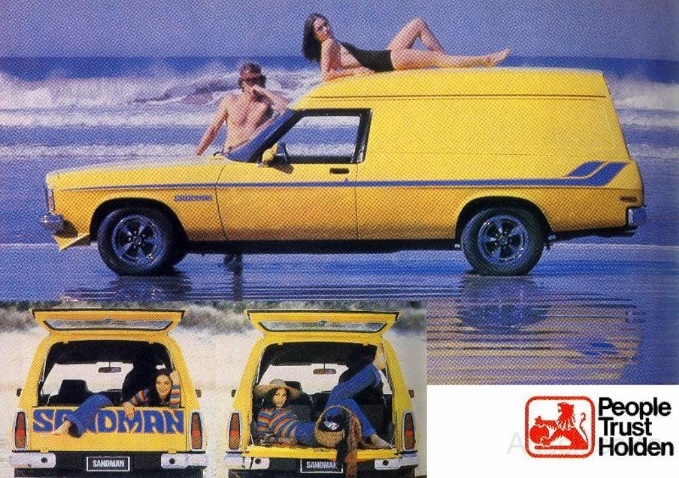 “The reborn Sandman is a celebration of the Aussie way of life”, insists Holden spokesman Sean Poppitt, in tribute to the iconic panelvan immortalised in Australian culture as the essential chick-magnet of the 1970s. But, quite obviously, things have changed. Rather than being released as the much-loved, original panelvan and ute, the sleek 2015 model is based on the look of a thoroughly contemporary Commodore wagon and ute. 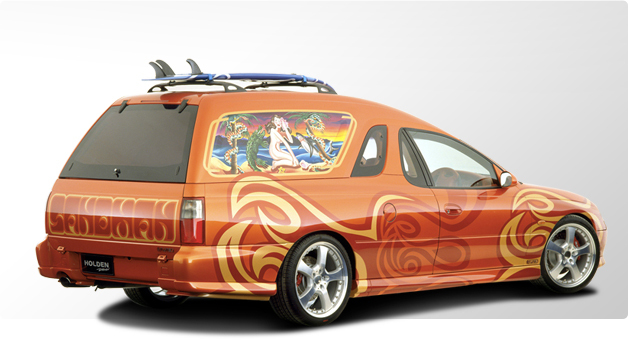 So it might have lost its fluffy dice and blacked out sides, but you can still take a trip down surfing lane with options on bright orange sheepskin seat covers (below) and an orange shag pile rug fitted in the rear cargo area of the Sportwagon. 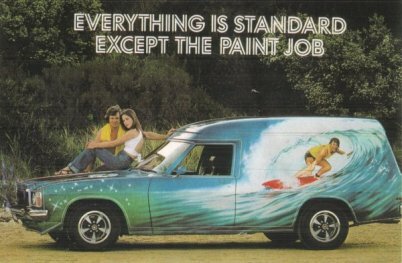 Whether it quite brings back the panelvan associations of sun, sea, sand, youth and the best of times on the road is another matter. At least it boasts a whole new level of comfort. Forget the old cassette deck and hard internal edges. Relish your music through a CD player and a wealth of music-streaming apps on a shiny new touch screen. Six airbags ensure you get safety along with your fun. The all-new Sandman will be available in three colours: Heron White, Nitrate Silver and Phantom Black. If you want the whole retro experience, harking back to the Sandman’s glory days, you can pay an extra $2950 for 20-inch gloss black wheels, black fender vents, a blacked-out grille, Sandman decals and contrast stitching on the dash, sunshades and Sandman-branded floor mats. The Sportwagon comes with black roof racks and unique build plate, while the ute is fitted with a black sports bar in the tray. The new Sandman has been a long time coming. Holden tested a concept ute way back in 2000 (above), when the steamy artwork on the side proved too much for US sensibilities. A Holden ute was eventually released in 2003 with a panelvan canopy, only to be dropped in 2006 following fitting difficulties and poor sales. Holden will have to weather the initial social media storm, assessing their sales when the dust finally settles to see if their risky revival has paid off.